Long-term cultured interferon-γ enzyme-linked immunospot assay is used as a measure of central memory responses and correlates with protective anti-mycobacterial vaccine responses. With this assay, peripheral blood mononuclear cells are stimulated with mycobacterial antigens and interleukin-2 for 14 days, enabling differentiation and expansion of central memory T cells. Maggioli, M. F., Palmer, M. V., Vordermeier, H. M., Whelan, A. O., Fosse, J. M., Nonnecke, B. J., Waters, W. R. Application of Long-term cultured Interferon-γ Enzyme-linked Immunospot Assay for Assessing Effector and Memory T Cell Responses in Cattle. J. Vis. Exp. (101), e52833, doi:10.3791/52833 (2015). Effector and memory T cells are generated through developmental programing of naïve cells following antigen recognition. If the infection is controlled up to 95 % of the T cells generated during the expansion phase are eliminated (i.e., contraction phase) and memory T cells remain, sometimes for a lifetime. In humans, two functionally distinct subsets of memory T cells have been described based on the expression of lymph node homing receptors. Central memory T cells express C-C chemokine receptor 7 and CD45RO and are mainly located in T-cell areas of secondary lymphoid organs. Effector memory T cells express CD45RO, lack CCR7 and display receptors associated with lymphocyte homing to peripheral or inflamed tissues. Effector T cells do not express either CCR7 or CD45RO but upon encounter with antigen produce effector cytokines, such as interferon-γ. Interferon-γ release assays are used for the diagnosis of bovine and human tuberculosis and detect primarily effector and effector memory T cell responses. Central memory T cell responses by CD4+ T cells to vaccination, on the other hand, may be used to predict vaccine efficacy, as demonstrated with simian immunodeficiency virus infection of non-human primates, tuberculosis in mice, and malaria in humans. Several studies with mice and humans as well as unpublished data on cattle, have demonstrated that interferon-γ ELISPOT assays measure central memory T cell responses. With this assay, peripheral blood mononuclear cells are cultured in decreasing concentration of antigen for 10 to 14 days (long-term culture), allowing effector responses to peak and wane; facilitating central memory T cells to differentiate and expand within the culture. Effector and memory T cells are generated through developmental programing of naïve CD4+ T cells after antigen recognition. Differentiation of naïve CD4+ T cells into cytokine producing cells requires pathogen recognition by innate immune cells, antigen presentation to T cells, co-stimulation and transcriptional changes resulting in polarized cytokine production. For example: antigen presenting cells produce interleukin (IL)-12 in response to intracellular pathogens, which, together with antigen recognition, promotes differentiation of T cells into T helper 1 (Th1) cells1,2 by signaling through signal transducer and activator of transcription 4 (STAT4) and T-box expressed in T cells (T-bet), leading to cell activation, IL-2 production, clonal expansion and interferon (IFN)-γ production3,4. If the infection is controlled, up to 95 % of the T cells generated during the expansion phase are eliminated (i.e., contraction phase) and memory T cells remain, sometimes for a lifetime5. Sallusto et al.6, revealed two functionally distinct subsets of memory T cells in humans based on the expression of lymph node homing receptors. Central memory T cells (Tcm) express C-C chemokine receptor (CCR)-7 and CD45RO and are mainly located in T-cell areas of secondary lymphoid organs. Tcm have limited effector function, a low activation threshold and retain high IL-2 production and proliferative capacity. Effector memory T cells (Tem) express CD45RO, lack CCR7 and display receptors for homing to peripheral or inflamed tissues. Effector cells do not express either CCR7 or CD45RO but promptly produce effector cytokines, such as IFN-γ, upon antigen recognition. IFN-γ release assays (IGRA) are used for the diagnosis of bovine and human tuberculosis7. Mycobacterium bovis is the principal agent of bovine tuberculosis (bTB) while human cases of tuberculosis are caused mainly by Mycobacterium tuberculosis. With these tests, whole blood or peripheral blood mononuclear cells (PBMC) are stimulated with mycobacterial antigens for 16 to 24 hr and IFN-γ production within the supernatant is measured by ELISA or through detection of cells producing IFN-γ using ELISPOT techniques. As a result of the brief stimulation period (i.e., 16 to 24 h) and rapid cytokine production, ex vivo assays detect primarily effector and Tem responses. This has been confirmed by flow cytometric analysis of cell populations in these cultures 8-10. Ex vivo IFN-γ responses are routinely included within the immune response panel evaluation of tuberculosis vaccines, including those used to evaluate responses by cattle. Most effective bovine tuberculosis vaccines elicit specific IFN-γ responses, but not all vaccines that induce IFN-γ responses are protective. Also, levels of IFN-γ elicited by vaccination, as measured before infection, do not necessarily correlate with protection. For instance, different BCG strains may have different capacities to induce ex vivo IFN-γ response, in spite of similar protection levels11. Thus, ex vivo IGRAs are valuable for tuberculosis diagnosis and for accessing vaccine immunogenicity; however, their use as predictors of vaccine efficacy is limited. Tcm responses to vaccination, on the other hand, may be used to predict vaccine efficacy, as demonstrated with simian immunodeficiency virus (SIV) infection in non-human primates12,13, tuberculosis in mice14 and malaria in humans15,16. After an effective immune response resulting in pathogen clearance, Tcm are maintained and provide protection to an eventual second infection by the same agent. A notable exception to this scenario is M. tuberculosis infection of humans in which patients receiving curative anti-mycobacterial therapy are susceptible to re-infection17,18. Additionally, events governing immunological memory during chronic infections, wherein the antigenic stimulation persists, are not well understood19. During chronic infections, such as with human immunodeficiency virus (HIV) and tuberculosis, a significant Tcm response is associated with a favorable outcome (e.g., latency with tuberculosis and subclinical disease with HIV)20,21. Several studies with mice and humans have demonstrated that long-term cultured IFN-γ ELISPOT assays measure Tcm responses16,20-22. With this assay, PBMCs are cultured in decreasing concentration of antigen for 10 to 14 days, allowing effector responses to peak and wane; facilitating Tcm to differentiate and expand within the culture. Long-term cultured IFN-γ ELISPOT assays have also been used in veterinary research, yet the phenotype of responding cells has been difficult to assess due to a lack of critical reagents, especially an antibody to CCR7. Effective bovine tuberculosis vaccines [e.g. using a single dose of M. bovis Bacille Calmette Guerin (BCG), BCG followed by viral-vectored Antigen 85A subunit vaccine, or attenuated M. bovisΔRD1] elicit long-term cultured IFN-γ ELISPOT responses following vaccination that correlate with protection (i.e., lower mycobacterial burden and decreased TB-associated pathology) against subsequent challenge with virulent M. bovis23,24. Furthermore, the numbers of antigen-specific IFN-γ-secreting cells within long-term PBMC cultures are higher at 12 months but decrease at 24 months after BCG vaccination of neonatal calves, correlating with the degree of protection detectable post M. bovis challenge25. In this scenario, the cultured IFN-γ ELISPOT is an important tool for predicting vaccine efficacy, providing a means to prioritize vaccine candidates for high cost efficacy trials. 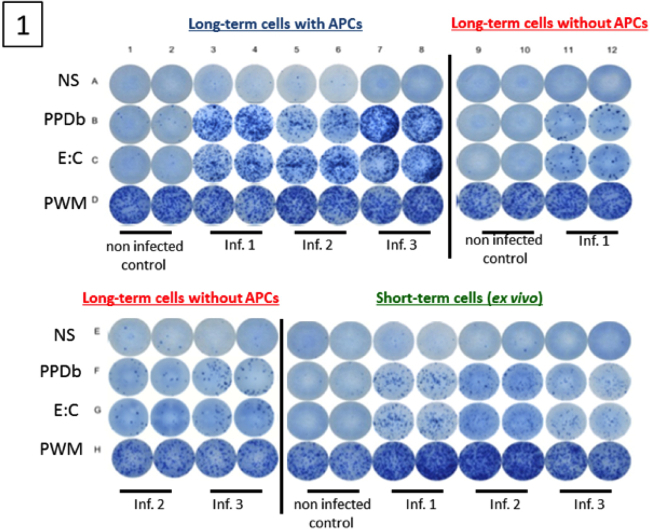 Additionally, cultured ELISPOT techniques can be adapted for various hosts, pathogens and cytokines by altering antigens or antibodies for a variety of purposes in different research fields. Prepare complete RPMI (cRMPI) by adding fetal bovine serum (FBS) to a concentration of 10 % (volume / volume), glutamine (2 µM), sodium pyruvate (1 µM), non-essential amino acids (0.1 µM), penicillin–streptomycin (100 units / ml penicillin and 0.1 mg / ml streptomycin) and 2-mercaptoethanol (50 mM) into RPMI 1640. Prepare 2 X acid citrate dextrose, by mixing sodium citrate (77 µM), citric acid (38 µM), and dextrose (122 µM), in distilled water. Prepare Ca2+ Mg2+ free phosphate buffered saline (PBS) pH 7.2: NaCl (137 mM), KCl (2.7 mM), Na2HPO4 (dibasic, 10 mM), KH2PO4 (monobasic, 2 mM) in distilled water; adjust the pH to 7.2. Prepare PBS 1% (PBS 1 % BSA) by adding bovine serum albumin into PBS (volume / weight, 1g / 100 ml of PBS). Prepare PBS + 0.05 % tween 20 (PBST) by adding 0.05 % tween 20 into PBS (volume / volume, 500 μl of tween 20 / 1 L of PBS). Prepare 100 mM Tris HCL pH 8.2 buffer by mixing Tris (100 mM), HCl (0.50 mM) in distilled water. Prepare 35 % ethanol solution by diluting ethyl alcohol (purity ≥99.5%) in distilled water (volume / volume, 35 ml of ethyl alcohol / 100 ml of distilled water). Filter sterilize cRPMI, 2 x acid citrate dextrose, PBS, PBS 1 % BSA using 0.22 μm filters. Prepare antigen solutions at twice the final concentration in cRPMI. Antigen choice is critical and should be tailored to the purpose of the study. Dilute recombinant M. tuberculosis antigens TB10.4 and antigen Ag85A to 2 μg / ml (of each antigen; the final concentration is 1 μg / ml). Dilute M. bovis purified protein derivative (PPD-B, Prionics Ag) to 10 μg / ml (the final concentration is 5 μg / ml). Dilute the recombinant early secretory antigenic target 6 (ESAT-6) and culture filtrate protein 10 (CFP-10) fusion protein (rESAT-6:CFP10) to 2 μg / ml (final concentration of 1 μg / ml). NOTE: These antigens are immunodominant IFN-γ inducing antigens of tuberculous mycobacteria and may be included to stimulate PBMC from M. bovis infected animals. BCG or M. bovis ΔRD1 vaccinated animals do not respond to rESAT-6:CFP10, as the region encoding these antigens (i.e., RD1) is deleted in these strains. rESAT-6:CFP10 used in these study was a kind gift from Dr. C. Minion, Iowa State University. TB10.4 and antigen Ag85A are immunodominant antigens present in virulent and vaccine M. bovis strains 37. PPDB, as a purified protein derivative, is a complex of several antigens including antigens shared with non-tuberculous mycobacteria. Infected animals will potentially respond to all antigens (namely: TB10.4, Ag 85A, rESAT-6:CFP10 and PPDb), while vaccinated animals should not respond to rESAT-6:CFP10 11. Plate 500 μl / well of antigen solution in quadruplicates for each animal in a 24 well plate. For this protocol, use antigens as a pool; thus use all wells contain all the antigens and no controls (such as, null or mitogen) this step. Incubate plate at 39 °C / 5 % CO2. The normal temperature of cattle is 39 °C; thus, some investigators utilize 39 °C for culture of bovine cells. Also, in certain instances with human cells, cell culture at 39 °C provides added benefit26,30. Pre-load syringes coupled with 16 or 18 G hypodermic needles with 6 ml of 2 X acid-citrate-dextrose; and collect 60 ml of bovine blood by jugular venipuncture. Add cells (500 μl / well) into antigen preloaded 24 well plate, in quadruplicate for each animal (step 2.5). Incubate plate at 39 °C / 5 % CO2. Using sterile technique, carefully remove 500 μl of the supernatant from each well without disturbing the cell layer. Replenish well volume by adding 500 μl / well of cRPMI containing IL-2 (30 U / μl, i.e., 15 U / well; recombinant human IL-2 Sigma I7908). Incubate plate at 39 °C / 5 % CO2. Using sterile technique, remove 750 μl of supernatant from each well. Replenish the volume with 750 μl / well of cRPMI ( without IL-2). Incubate plate at 39 °C / 5 % CO2. Label the ELISPOT plate properly for each set of samples, to avoid mistakes when plating cells: long-term cells plus antigen presenting cells (APCs), long-term cells without APCs and ex vivo / short-term cells (Figure 1). Replicates for each treatment (i.e. antigenic stimulation) should be done at least in duplicate. Prepare capture antibody solution by diluting mouse anti-bovine IFN-γ antibody (MCA2112, clone CC330) in PBS (8 μg / ml). Using a multichannel pipettor pre-wet the wells of the ELISPOT plate with 15 μl / well of 35 % ethanol for 1 min. To prevent membrane damage, do not touch the bottom of wells with pipette tips at any point during the assay. Wash plate six times with 300 μl / well of PBS. Wash fluid should be discarded by plate inversion. Washes should be done rapidly, not allowing plate wells to dry. Pipette 100 μl / well of capture anti-IFN-γ antibody (from step 1 above). Incubate at 4 °C O/N (keep the plate inside a zippered storage bag). Prepare antigen solutions at twice the final concentration. Treatments are: no stimulation (cRPMI), PPD-B (20 μg / ml, final concentration: 10 μg / ml), protein cocktail of TB10.4 and Ag85A (2 μg / ml of each protein, final concentration: 1 μg / ml of each protein), rESAT-6:CFP10 (for M. bovis infection, 2 µg / ml, final concentration: 1 μg / ml), and a positive control, such as pokeweed (20 μg / ml, final concentration: 10 μg / ml). Other mitogen may be used instead of PWM (e.g., Concanavalin A). NOTE: for this step antigens compose four different treatments and are not used as a pool (as in step 2.5). The four treatments are: NS, PPDb, protein cocktail (TB10.4 and Ag85A constitute one treatment) and PWM. Collect 60 ml blood from the same animals bled on day 1 (under: long-term culture, 14 day protocol) and isolate PBMCs as before. Adjust cell concentration to 2 X 106 cells / ml. Label tubes clearly to prevent misallocation when plating cells. These cells will be used for APCs isolation and also as short-term cell culture (step 6.5). Label tubes with both the animal number and the type of culture (in this case: ex vivo, short-term or fresh cells). Remove excess capture antibody from the ELISPOT by plate inversion. Wash plates 6 times with 300 μl PBST. Remove as much PBST as possible. Pipette 50 μl of cell suspensions to the wells labeled as long-term cells plus APCs. Block other wells with 200 μl / well of cRPMI. Incubate 90 min at or 39 °C. Pre-warm cRPMI to or 39 °C (necessary for subsequent steps). Fresh PBMCs not used for adherent cell (APCs) isolation will be needed in subsequent steps and should be stored. During the 90 min incubation (step 4.4, short-term culture and adherent cell isolation step), harvest long-term cultured cells. Using 5 or 10 μl pipettes, pipette media with cells up and down to detach cells, combine the quadruplicate replicates from each animal into a single 15 ml tube. Centrifuge the tubes for 5 min at 400 g.
After centrifugation, discard the supernatant by tube inversion. Dislodge cell pellet. Add 5 ml of PBS, gently re-suspend pellet, if necessary. Repeat the centrifugation. Repeat the washing step twice. Discard supernatant by tube inversion and gently re-suspend cells in 1ml cRPMI. Adjust cell concentration to 2 X 105 cells / ml. After the 90 min incubation, shake plates on plate shaker for 30 sec. Remove non-adherent cells by plate inversion. Pipette 150 μl / well of warm cRPMI (from step 4, under: Short-term cells and adherent cell (APCs) isolation step). Shake plates and discard wash fluid. Repeat wash 3 times. Add 100 μl / well of each antigen into appropriate wells (pre-labeled). To plate cells, pipette 100 μl / well of long-term cultured cell suspension (2 x 105 cells / ml) into the wells labeled as long-term cells plus APCs. Ensure that the long-term cells added in this step are from the same animal as the APC’s already in the well. Do not mix APC’s and long-term cultured cells from different animals. Pipette 100 μl / well of the long-term cultured cell suspension (2 x 105 cells / ml) into wells without APCs for assessment of APC requirement to the long-term culture response. Add 100 μl / well of short-term cells (freshly isolated and adjusted to 2 x 106 cells / ml) for ex vivo response assessment. Incubate plates O/N at 39 °C / 5 % CO2 incubator. Ensure that plates are lying flat and do not stack plates. NOTE: If analysis of cell phenotype is desired, flow cytometry can be performed as an ancillary assay. Cells are plated in 96 well U bottom plates (instead of ELISPOT plates) as described for ELISPOT assay. Capture antibody adsorption (steps 3.4 to 3.5) should be skipped. Cells are then incubated O/N at 39 °C / 5 % CO2 and a standard cell staining protocol performed. Cell staining reagents are included in the reagents table. Dilute detection antibody (mouse anti-bovine IFN-γ, clone CC302) to 5 μg / ml in PBS 1 % BSA. Discard fluids from wells and wash plates: six times with PBST (300 μl / well), placing on shaker each time for 10 sec before and in-between washes, once with dH2O (300 μl / well), an additional 6 times with PBST (300 μl / well) and two times with PBS (300 μl / well). After cells are removed from the plates, and if no biosafety concerns apply, procedures may be performed outside biological safety cabinets. Discard wash fluid. Remove as much wash fluid as possible by tapping plate on paper towels. Add detection antibody (100 μl / well). Incubate plates for 120 min at or 39 °C. During this incubation step, prepare alkaline phosphatase solution following the manufacturer's instructions. Thirty min before use (i.e., 90 min after addition of detection antibody to wells) dilute the reagent in PBST. Invert the tube gently to mix reagents and incubated at RT. After the 120 min incubation, discard excess detection antibody by plate inversion. Wash plate 6 times with PBST (300 μl / well). Remove as much wash fluid as possible by tapping plate on paper towels. Add 100 μl / well of alkaline phosphatase solution (from step 3 above). Incubate plates for 45 min at RT. Discard fluid and wash each plate 6 times with PBST (300 μl / well). Prepare the substrate solution following the manufacturers' instructions (Vector Blue AP substrate III): Dilute reagents in 100 mM Tris HCL pH 8.2 buffer. Pipette 50 μl / well of the substrate solution. Incubate at RT until blue color starts to develop (approximately 30 min). Discard fluid and wash plates with copious amounts of dH2O. Remove bottom plate to expose membrane, wash back of wells and allow plate to air dry. Read plates on immunospot image analyzer or ELISPOT reader (Table 1), or manually, using a stereomicroscope. Alternatively, keep plates in dark at RT until reading. Because of the high stability of the reaction substrate, quality is preserved for several years. NOTE: Cells and antigen concentrations were optimized to avoid wells with uncountable spots 23,24,27,37. It is possible that uncountable spots formation occur in different settings or due to biological variation. If that is the case, cell concentration should be optimized so a readable spot counting response is obtained. Perform analysis as per the Cellular Technology Limited (CTL) ELISPOT plate reader guide (Table 1). After the spots counts are obtained for each of the wells, calculate the average between duplicates. The specific immune response to each antigenic stimulus is calculated by subtracting the average number of spots in non-stimulated wells from that of antigen-stimulated wells. Approximately one-month post-aerosol infection with M. bovis (104 colony-forming units), PBMCs from infected (n=8) and control animals (n=8) were cultured in the presence of antigens and IL-2 for 13 days. Development of Tcm responses after infection was determined using IFN-γ ELISPOT assay. Representative Tcm (in the presence or absence of APCs) and exvivo IFN-γ ELISPOT responses from infected animals (Three animals) and a non-infected animal (one animal) are shown in Figure 1. A successful long-term IFN-γ ELISPOT assay results in cells producing IFN-γ (Spot-Forming Cells, SFC) under stimulated conditions and near absence of a response from non-infected animals and under non-stimulated conditions. Also, a strong T cell response should occur in response to PWM. Specific responses to M. bovis were assessed by PPD-B or rESAT-6:CFP10 antigenic stimulation. As shown in Figure 1, robust Tcm and ex vivo responses to PPD-B and rESAT-6:CFP10 were detected from all three M. bovis-infected animals. Minimal to no Tcm and ex vivo responses were detected from the control animal. Also, the presence of APCs was required for optimal Tcm responses by infected animals, as demonstrated by greatly reduced responses by long-term cells cultured in the absence of autologous APCs. IFN-γ response by PBMCs from M. bovis infected and non-infected animals are presented in Figure 2. The number of SFCs from each animal was calculated as the average number of SFCs in duplicate samples in response to PPD-B minus the respective response to media alone. Responses were estimated for 106 cells. Responses differed (P < 0.05) based upon infection status, presence or absence of APCs and culture duration (i.e., long-term culture versus ex vivo culture). 2. Open “Immuno Capture” Version 6.3 software. 3. Step 1: select plate type. 4. Step 2: load plate. 5. Step 3: select scanning options. 6. Step 4: start scanning. 7. Obtain overview image of plate. 9. Quit “Immuno Capture” software. 1. Open “Immuno Spot Capture” Version 5.0 software. 2. Select object type: normal. 3. Select counting module: smart count. 4. Step 1: load plate. 5. Step 2: define counting parameters: test accuracy of spot recognition on wells with different spots. 1. Open “Immunospot Capture” Version 5.0 software. 2. Select counting module: quality control. 3. Step 1: load plate. 4. Step 2: Analyze highlighted wells individually. Table 1 - AutoImmun Diagnostika ELISPOT reader image acquisition and cell counting procedure. Figure 1. Image of wells from a long-term cultured IFN-γ ELISPOT assay. Cultured IFN-γ ELISPOT assay was performed approximatelyone month after challenge with virulent M. bovis (three animals). Non-infected animals were included as controls (one animal). Long-term cell lines were generated by stimulating PBMC with a cocktail of recombinant Ag85A (1 µg / ml), TB10.4 (1 µg / ml), rESAT-6:CFP10 (1 µg / ml) and PPD-B (5 µg / ml) for 13 days followed by transfer to ELISPOT plates in the presence or absence of autologous APC. Short-term cells consisted of PBMC isolated on day 13 and plated directly into ELISPOT plates. Long-term and short-term cells were stimulated with PPD-B (10 µg / ml), rESAT-6:CFP10 (1 µg / ml), medium alone or pokeweed mitogen (5 μg / ml) for 24 h.
Figure 2. Representative results from a long-term cultured IFN-γ ELISPOT response to M. bovis purified protein derivative (PPD-B). Cultured IFN-γELISPOT assay was performed approximatelyone month after challenge with virulentM. bovis (eight animals). Non-infected animals were included as controls (eight animals Long-term cells were generated by stimulating PBMC with a cocktail of recombinant Ag85A (1 µg / ml), TB10.4 (1 µg / ml), rESAT-6:CFP10 (1 µg / ml) and PPD-B (5 µg / ml) for 13 days followed by transfer to ELISPOT plates in the presence or absence of autologous APCs. Short-term cells consisted of PBMC isolated on day 13 and plated directly into the ELISPOT plate. Long-term and short-term cells were stimulated with PPD-B (10 μg / ml) or medium alone for 24 h. Specific responses from each animal (SFC / 106 cells) are presented as response to PPD-B (average of duplicate samples) minus the response to media alone. IFN-γ production in long-term cultured ELISPOT assays is generally due to Tcm in humans, but how this response develops in culture is poorly understood. Whether Tcm are present in circulation and expand in vitro, or if the Tcm responses result from differentiation of effector and Tem cells into Tcm during culture is not known. However, studies with samples from humans have found that CD4+ T cells from ex vivo and long-term cultured IFN-γ ELISPOT assays have unrelated epitope specificities, implying that Tcm responses do not develop from effector cells28. Obviously, the duration of the response may vary, but if pathogen clearance is achieved, eventually both ex vivo and Tcm responses decline. Also, responses of long-term cultures measured early and long after antigenic priming (when the effector response is lower) is shown to correlate, indicating that circulating Tcm populations early and long after antigenic priming remains related in vivo. On the other hand, the magnitude of the ex vivo response does not appear to be related to the magnitude of the memory response29. These results suggest that long-term cultured IFN-γ ELISPOT responses result from in vitro expansion of Tcm and an associated waning of effector responses in the sample, rather than the differentiation of effector cells into Tcm phenotype. With cattle, the relative contribution of effector and memory subsets to responses detected by the long-term IFN-γ ELISPOT assays is not known. Recent studies indicate a correlation between vaccine elicited long-term cultured IFN-γ ELISPOT responses and protection against subsequent experimental infection with M. bovis23-24. It has been reported that weak long-term IFN-γ ELISPOT responses to vaccination are associated with the absence of protection30. Both live and killed vaccines induce similar ex vivo IFN-γ ELISPOT responses, but vaccination with live BCG elicits stronger long-term cultured IFN-γ ELISPOT responses than do killed vaccine preparations. Interestingly, live vaccines are protective while killed formulations fail to provide protection against challenge with virulent tuberculous mycobacteria 31-32, 33. Assessment of Tcm responses is also feasible by sorting these cells from PBMC. Direct enrichment of Tcm from PBMC, however, requires expensive devices, highly trained personal and is difficult as these cells are not numerous in the blood stream. Long-term culture of PBMC provides enrichment of Tcm over Tem and effector cells without expensive devices; however, because these T cell populations are expanded in vitro they may be less representative of in vivo memory responses. It is possible to access IFN-γ memory responses (using the long-term culture or Tcm sorting strategies) by assays other than the ELISPOT such as: cytokine ELISAs34, cytokine bead arrays (CBA), intracellular staining (ICS), or cytokine protein arrays (CPA). These methods; however, are generally less sensitive than ELISPOT assays35. An advantage of ELISPOT is its ability to detect the immediate capture of the cytokine shortly after its release preventing dilution in the supernatant and degradation by enzymatic cleavage or cytokine uptake by other cells. ELISPOT assays detect single cells producing cytokines providing precise results even in low signal to noise scenarios (i.e., low specific responses)35. Also, with ICS, detection of cytokines prior to release may result in false identification of cells producing cytokines (e.g., due to post-translational modulation before or during the secretory process)34. The transport inhibitors employed with ICS assays to minimize cytokine secretion during antigen stimulation (known as Golgi stop proteins) limit the duration of cell stimulation due to the cell toxicity of these proteins ultimately impacting cytokine production35. With that said - CBA, CPA and ICS are useful techniques for measuring multiple cytokines simultaneously and / or for determining cell surface marker expression (i.e., with ICS). Therefore, these methods may be used in combination with the IFN-γ ELISPOT assay36. While previous bovine TB vaccine efficacy studies measured Tcm responses via ELISPOT assay, the detection of Tcm responses by other techniques will likely yield comparable results. Importantly, the ELISPOT assay is less expensive and simpler to perform than CBA, CPA and ICS analysis techniques34. Manual counting of the SFC is an alternative to automated counting, and ELISPOT plates can be stored at RT for long period of time with minimal quality loss, before or after spot counting37. The long-term cultured IFN-γ ELISPOT response has been applied to assess memory responses by human, and cattle when evaluating tuberculosis vaccine responses14-16,31-32,33. Tcm responses are also assumed to play significant roles in host responses to several other infectious agents of cattle, such as: Mycoplasma mycoides subsp. mycoides42, Anaplasma marginale38 and bovine respiratory syncytial virus39. Potentially, the long-term ELISPOT assay might be adapted for other animal species, cytokines and infections. These broader applications will be especially useful for veterinary immunology applications due to current limited availability of specific reagents. Tcm responses are crucial for protection against several infections, but measuring them early after infection / immunization (for disease outcome prediction or vaccine efficacy) may be cumbersome. Analysis of the immune response under ex vivo and short antigenic stimulation conditions will more often represent effector responses, due to the overlap of memory and effector responses, especially during the beginning of immunological memory formation. In the context of chronic diseases in which the antigen load is continual, ex vivo responses will assess effector cell responses or a combination of memory and effector cell responses. The long-term cultured IFN-γ ELISPOT assay, described here, likely enables the measurement of Tcm responses rather than effector T cell or combined CD4+ T cell responses. In summary, the long-term cultured IFN-γ ELISPOT assay provides a valuable approach for estimating T cell memory responses and has been employed successfully to evaluate memory responses of several species to a variety of infections agents12-16, 20-25,29,31,33,34,38,39. Research was supported by USDA, ARS Cris: 3625-32000-104 and Agriculture and Food Research Initiative Competitive Grant no. 2011-67015-30736 from the USDA National Institute of Food and Agriculture. We thank Jessica Pollock, Emma Frimml-Morgan, Shelly Zimmerman, Kristin Bass, Bruce Pesch, Molly Stafne, Allen Jensen, and Tracy Porter for their excellent technical assistance as well as Rebecca Madison, Doug Ewing, Katie Pille, Jay Steffen, David Lubbers, Robin Zeisness, and David Panthen for the excellent care and handling of animals. Szabo, S. J., Kim, S. T., Costa, G. L., Zhang, X., Fathman, C. G., et al. Novel transcription factor, T-bet, directs Th1 lineage commitment. Cell. 100, (6), 655-669 (2000). Mullen, A. C., High, F. A., Hutchins, A. S., Lee, H. W., Villarino, A. V., et al. Role of T-bet in commitment of Th1 cells before IL-12-dependent selection. Science Signaling. 292, (5523), 1907 (2001). Mosmann, T. R., Cherwinski, H., Bond, M. W., Giedlin, M. A., Coffman, R. L. Two types of murine helper T cell clone. I. Definition according to profiles of lymphokine activities and secreted proteins. Journal of immunology. 136, (7), 2348-2357 (1986). Lighvani, A. A., Frucht, D. M., Jankovic, D., Yamane, H., Aliberti, J., et al. T-bet is rapidly induced by interferon-gamma in lymphoid and myeloid cells. Proceedings of the National Academy of Sciences of the United States of America. 98, (26), 15137-15142 (2001). Masopust, D., Picker, L. J. Hidden memories: frontline memory T cells and early pathogen interception. Journal of immunology. 188, (12), 5811-5817 (2012). Sallusto, F., Lenig, D., Förster, R., Lipp, M., Lanzavecchia, A. Two subsets of memory T lymphocytes with distinct homing potentials and effector functions. Nature. 401, (6754), 708-712 (1999). Waters, W. R., Palmer, M. V., Thacker, T. C., Davis, W. C., Sreevatsan, S., et al. Tuberculosis immunity: Opportunities from studies with Cattle. Clinical and Developmental Immunology. 2011, (1), 1-11 (2011). Whelan, A. O., Villarreal-Ramos, B., Vordermeier, H. M., Hogarth, P. J. Development of an antibody to bovine IL-2 reveals multifunctional CD4 T(EM) cells in cattle naturally infected with bovine tuberculosis. PLoS ONE. 6, (12), e29194 (2011). Streitz, M., Tesfa, L., Yildirim, V., Yahyazadeh, A., Ulrichs, T., et al. Loss of receptor on tuberculin-reactive T-cells marks active pulmonary tuberculosis. PLoS ONE. 2, (8), e735 (2007). Soares, A. P., Scriba, T. J., Joseph, S., Harbacheuski, R., Murray, R. A., et al. Bacillus Calmette-Guérin vaccination of human newborns induces T cells with complex cytokine and phenotypic profiles. Journal of immunology. 180, 3569-3577 (2008). Waters, W. R., Palmer, M. V., Buddle, B. M., Vordermeier, H. M. Bovine tuberculosis vaccine research: historical perspectives and recent advances. Vaccine. 30, (16), 2611-2622 (2012). Letvin, N. L., Mascola, J. R., Sun, Y., Gorgone, D. A., Buzby, A. P., et al. Preserved CD4+ central memory T cells and survival in vaccinated SIV-challenged monkeys. Science. 312, (5779), 1530-1533 (2006). Mattapallil, J. J., Douek, D. C., Buckler-White, A., Montefiori, D., Letvin, N. L., et al. Vaccination preserves CD4 memory T cells during acute simian immunodeficiency virus challenge. The Journal of experimental medicine. 203, (6), 1533-1541 (2006). Lindenstrom, T., Knudsen, N. P. H., Agger, E. M., Andersen, P. Control of Chronic Mycobacterium tuberculosis .infection by CD4 KLRG1- IL-2-secreting central memory cells. The Journal of Immunology. 190, (12), 6311-6319 (2013). Todryk, S. M., Bejon, P., Mwangi, T., Plebanski, M., Urban, B., et al. Correlation of memory T cell responses against TRAP with protection from clinical malaria, and CD4 CD25 high T cells with susceptibility in Kenyans. PLoS ONE. 3, (4), e2027 (2008). Webster, D. P., Dunachie, S., Vuola, J. M., Berthoud, T., Keating, S., et al. Enhanced T cell-mediated protection against malaria in human challenges by using the recombinant poxviruses FP9 and modified vaccinia virus Ankara. Proceedings of the National Academy of Sciences. 102, (13), 4836-4841 (2005). Rie, A., Warren, R., Richardson, M., Victor, T. C., Gie, R. P., et al. Exogenous reinfection as a cause of recurrent tuberculosis after curative treatment. New England Journal of Medicine. 341, (16), 1174-1179 (1999). Caminero, J. A., Pena, M. J., Campos-Herrero, M. I., Rodríguez, J. C., Afonso, O., et al. Exogenous reinfection with tuberculosis on a European Island with a moderate incidence of disease. American Journal of Respiratory and Critical Care Medicine. 163, (3), 717-720 (2001). Sallusto, F., Lanzavecchia, A., Araki, K., Ahmed, R. From vaccines to memory and back. Immunity. 33, (4), 451-463 (2010). Millington, K. A., Gooding, S., Hinks, T. S. C., Reynolds, D. J. M., Lalvani, A. Mycobacterium tuberculosis.-specific cellular immune profiles suggest bacillary persistence decades after spontaneous cure in untreated tuberculosis. The Journal of infectious diseases. 202, (11), 1685-1689 (2010). Su, L. F., Kidd, B. A., Han, A., Kotzin, J. J., Davis, M. M. Virus-specific CD4(+) memory-phenotype T cells are abundant in unexposed adults. Immunity. 38, (2), 373-383 (2013). Goletti, D., Butera, O., Bizzoni, F., Casetti, R., Girardi, E., Poccia, F. Region of difference 1 antigen-specific CD4+ memory T cells correlate with a favorable outcome of tuberculosis. The Journal of infectious diseases. 194, (7), 984-992 (2006). Waters, W. R., et al. Efficacy and immunogenicity of Mycobacterium bovis. DeltaRD1 against aerosol M. bovis. infection in neonatal calves. Vaccine. 27, (8), 1201-1209 (2009). Hope, J. C., et al. Identification of surrogates and correlates of protection in protective immunity against Mycobacterium bovis. infection induced in neonatal calves by vaccination with M. bovis. BCG Pasteur and M. bovis. BCG Danish. Clinical and Vaccine Immunology. 18, (3), 373-379 (2011). Thom, M. L., et al. Duration of immunity against Mycobacterium bovis. following neonatal vaccination with bacillus Calmette-Guérin Danish: significant protection against infection at 12, but not 24, months. Clinical and Vaccine Immunology. 19, (8), 1254-1260 (2012). Aabye, M. G., Ravn, P., Johansen, I. S., Eugen-Olsen, J., Ruhwald, M. Incubation of whole blood at 39°C augments gamma interferon (IFN-γ)-induced protein 10 and IFN-γ responses to Mycobacterium tuberculosis .antigens. Clinical and vaccine immunology : CVI. 18, (7), 1150-1156 (2011). Maue, A. C., Waters, W. R., Davis, W. C., Palmer, M. V., Minion, F. C., Estes, D. M. Analysis of immune responses directed toward a recombinant early secretory antigenic target six-kilodalton protein-culture filtrate protein 10 fusion protein in Mycobacterium bovis.-infected cattle. Infection and Immunity. 73, (10), 6659-6667 (2005). Godkin, A. J., Thomas, H. C., Openshaw, P. J. Evolution of epitope-specific memory CD4(+) T cells after clearance of hepatitis C virus. Journal of immunology. 169, (4), 2210-2214 (2002). Todryk, S. M., et al. The relationship between human effector and memory T cells measured by ex vivo and cultured ELISPOT following recent and distal priming. Immunology. 128, (1), 83-91 (2009). Vordermeier, H. M., et al. Viral booster vaccines improve Mycobacterium bovis. BCG-induced protection against bovine tuberculosis. Infection and Immunity. 77, (8), 3364-3373 (2009). Orme, I. M. Induction of nonspecific acquired resistance and delayed-type hypersensitivity, but not specific acquired resistance in mice inoculated with killed mycobacterial vaccines. Infect. Immun. 56, (12), 3310-3312 (1988). Griffin, J. F., Mackintosh, C. G., Slobbe, L., Thomson, A. J., Buchan, G. S. Vaccine protocols to optimise the protective efficacy of BCG. Tubercle and lung disease : the official journal of the International Union against Tuberculosis and Lung Disease. 79, (3), 135-143 (1999). Buddle, B. M., et al. Protection of cattle from bovine tuberculosis by vaccination with BCG by the respiratory or subcutaneous route, but not by vaccination with killed Mycobacterium vaccae. Research in veterinary science. 59, (1), 10-16 (1995). Lehmann, P. V., Zhang, W. Unique strengths of ELISPOT for T cell diagnostics. Methods in Molecular Biology. 792, (Chapter 1), 3-23 (2011). Tincati, C., Iii, A. J. C., Snyder-Cappione, J. E. Distinguishing latent from active Mycobacterium tuberculosis. infection using Elispot assays: looking beyond interferon-gamma). Cells. 1, (2), 99-99 (2012). Lash, G. E., Pinto, L. A. Multiplex cytokine analysis technologies. Expert review of vaccines. 9, (10), 1231-1237 (2010). Vordermeier, M., Whelan, A. O. ELISPOT assays to enumerate bovine IFN-γ-secreting cells for the development of novel vaccines against bovine tuberculosis. Methods in molecular biology. 792, 219-227 (2012). Han, S., Norimine, J., Palmer, G. H., Mwangi, W., Lahmers, K. K., Brown, W. C. Rapid deletion of antigen-specific CD4+ T cells following infection represents a strategy of immune evasion and persistence for Anaplasma marginale. Journal of immunology. 181, (11), 7759a-7769a (2008). Helden, M. J. G., et al. Pre-existing virus-specific CD8(+) T-cells provide protection against pneumovirus-induced disease in mice. Vaccine. 30, (45), 6382-6388 (2012).